It's time for another 2Peas Gardeners' Digest - a monthly blog hop hosted by the 2Peas Garden Girls! 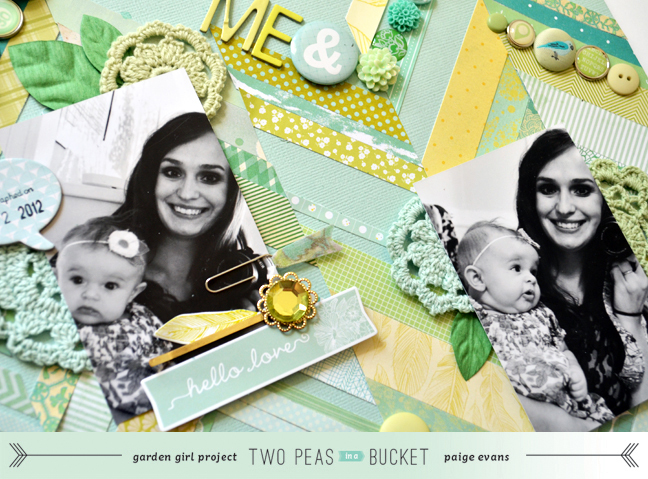 Below you will find a sneak of one of my upcoming layouts for the 2Peas Project Gallery, a couple of layouts from another scrapbooker that inspires me, a list of 5 items that I've placed in my shopping cart, and a giveaway! Here is a little sneak of the mint green-themed layout that I created for the April 1st Garden debut. Check out the rest of my Garden Girl creations HERE. Leah Farquharson is an amazingly talented lady! She scrapbooks, she sews, she's a mom - I don't know how she does it all. 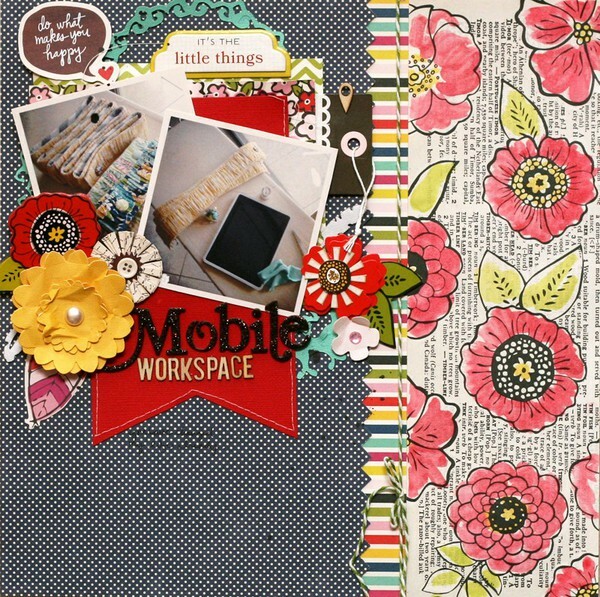 I LOVE these two layouts she made for her monthly American Crafts assignment and shared in the 2Peas gallery. On the "Mobile Workspace" layout, Leah painted on the patterned paper - genius! Makes me want to bust out my long-forgotten art supplies. 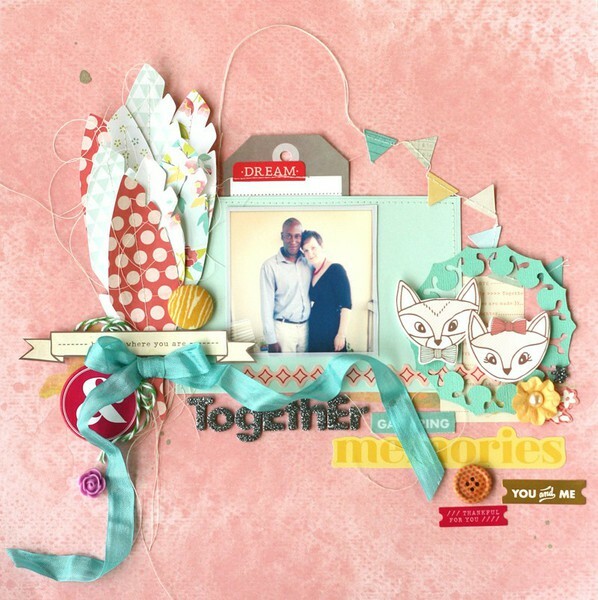 On this "Together" layout, Leah made such a fun collage of product - feather, foxes, ribbon, and more! Not to mention the cute photo of her and her hubby. Love love love it. Make sure to check out more of Leah's projects on her blog and 2Peas gallery. Definitely lots of cute and girly things in my cart! I've got a giveaway to go along with this post! It's just a dabbling of some leftover/double/extra scrapbooking supplies. 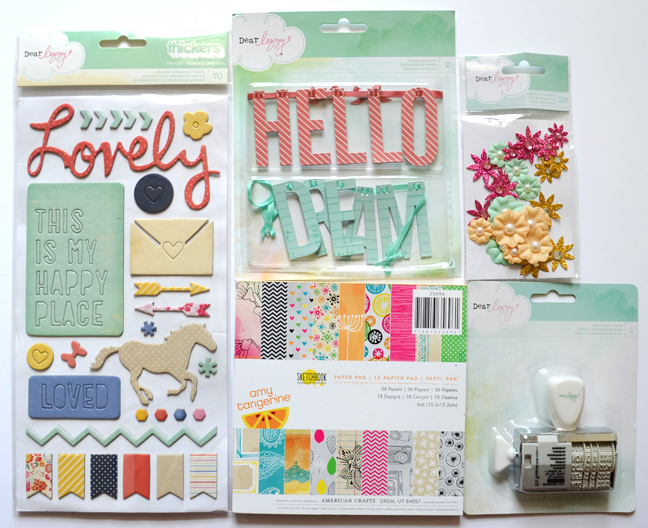 Namely, chipboard shapes Thickers from the brand new Lucky Charm line by Dear Lizzy, word banners from Dear Lizzy, a 6x6 paper pad from the Sketchbook line by Amy Tangerine, glitter flowers from Dear Lizzy, and a Dear Lizzy roller date stamp. Niiiiiiiiice! To enter this giveaway, leave a comment on this post by Thursday March 28th 2013 letting me know what your plans are for this weekend. Easy as that! I'll announce the winner that same day. Leah is very artistic, love her work! And love your sneak. I love that chipboard that says this is my happy place. So adorable. Wow! What a fun giveaway! We're looking at a few houses this Saturday, and just chillin' on Sunday!! I cannot wait to see your full layout! Love the sneaks! This weekend I plan to catch up on house chores (boo! ), sleep, and this pile of layouts I have planned! Thanks for the awesome giveaway! Plans for the weekend? Haul the desk out of my daughter's room (that's been the "plan" for a few weeks now), and clean the bird cage. Exciting, huh? I'm sure fun will be had, but it's usually spontaneous , not planned! This weekend I'm hoping to finish the album I'm making for my son and his wife as their first anniversary present. Thanks for all the wonderful inspiration. going camping with my husband, six year old daughter, and church friends! With this whole lot of inspiration in my mind, i´m definitly going to scrapbook the last few of my holiday pictures from last year this weekend! Yep, this April layout will be another stunner! I cannot wait to see the full reveal. Love Leah's projects and I have several of your faves on my list too! Weekend plans include a picnic at the park, train ride and zoo. oh my goodness!! I am soo excited to see the full reveal of your April layout! Your layouts are always to die for! You are so talented. Great inspiration layouts and I love what you have in your shopping cart! I also need some of that Alison Kreft! This weekend I am going bridesmaid dress shopping with my best friend who is getting married in October! It should be fun! Thanks for the chance! Can't wait to see your complete layout! It looks so inspiring! Looking forward to a few movies this weekend and maybe a couple of fun walks too! Thanks for the chance! Loving the sneaks. My plans are doing some projects around the house and having some friends over. A nice fun weekend. My plans are to take the my younger son to the fair with some friends. Can't wait to eat those a foot long corn dog and cotton candy! Whoot Whoot! fun giveaway and i like whats in your cart ;) I am about 3 1/2 weeks from having our 5th child so this weekend we are working on my "gotta get it done" list lol. 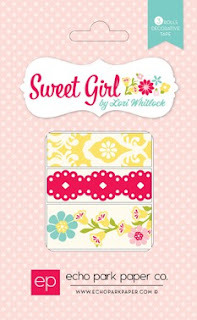 Leah's layout is awesome-and I love your product picks!! Thanks for sharing Leah's pages. Awesome stuff! My weekend plans include scrapping! Woohoo! Thanks for sharing Leah's pages! Gorgeous work!! I hope my weekend plans include a little time for scrapping but will be busy with a birthday party and work! I love your sneak! Your work is always fabulous! I agree that Together layout by Leah is just gorgeous! Thanks for the hop! I am loving the Dear Lizzy date stamps. and awesome inspiration! Thanks for the chance on the giveaway! The sneak looks interesting. Looking forward to seeing the page. Oh that sneak is making me swoon! I can't wait to see the whole thing! Thanks so much for the chance to win some goodies too! Love your heart page, so creative! We don't have a lot of plans this weekned except waiting to see if we will be snowed in, silly groundhog got it all wrong this year!! Love the sneak of your layout. It looks fabulous. I am going to break out my March Studio Calico kit, finally!! Tricky as we're snowed in so probably some scrapping and movie watching with the hubby. Your sneak looks great! Can't wait to see the rest of your LO next month! This weekend (which is now in NZ) I am going to collect my car which has been slowly making its way from the UK to NZ, I can't wait to have it back! Love your sneak peak. I am a huge fan of b/w and mint /aqua combo so can't wait to see your whole lO. The inspiration LO is amazing. I will be checking out her stuff. The green page looks interesting! Playing in the snow we just received last night! Love that dear lizzy rolling stamp! I just gave up my weekend job to free up more time to write. So, what will I be doing this weekend? Writing. Well, let's be honest, writing and scrapping! Scrapping and staying warm, we're having a cold snap here in the UK at the moment! 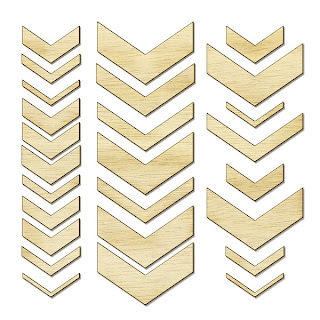 Great sneaks and I'm loving your 5 picks, especially the chevron veneers! love the sneak peak! Spending time with the hubby and kids this weekend as he was out of town for awhile this past week! Hello! Am glad to discover your blog through this blog hop :-) My husband is working this weekend so me and my daughters will just hang out and spend some time at home. Love your green layout, so springy. My husband works this weekend so I'm going to visit my Mom and work on taxes. Thanks for that chance to win. This weekend I have to do my normal weekend errands I can't do all week..but then, I'm off to find some gesso to experiment!! Can't wait to see the whole layout! You are so talented! Oooo...can't wait to see your mint and yellow page! I plan on doing some work around the house this weekend...namely recaulking the master bath shower! Already what I can see! I have been searching for the white roller date stamp of dear lizzy's . Crossing my fingers , I hope I win! I love your sneak! I'm spending the weekend with my mom who is visiting, my eldest daughter (3,5 years) miss her so much when she's not here and me too. I love your sneaks. I have been enjoying your videos at two peas. This weekend I have to work, but after I plan on scrapping. I received some new products and can't wait to play! Thanks for the chance to win. Love the layout with the paper feathers from Leah! Thanks for sharing with us. I too can't wait to see the rest of the mint page. I am currently very much in love with mint, so thank you for that inspiring layout. This weekend I am cleaning my house in anticipation for company next week on Easter. I will going back to mom's house during the weekend, just spending time with her. awesome! im gonna dye my hair! I am spending the weekend decorating tee shirts for my granddaughter' third birthday party. Thanks for the opportunity to win. Love your work! My weekend is going to be cleaning up the fallout from making a Disney Autograph book in a rush. yes, I had planned to take my time and have it done way before the trip only to do it in 36 hours, right before we left! I have friends coming from out of town. So excited to spend time with them. BTW, love the glimpse of your mint green project. My weekend plans include shopping for a new outfit for my interview next week which I am VERY excited about. Love your five things. 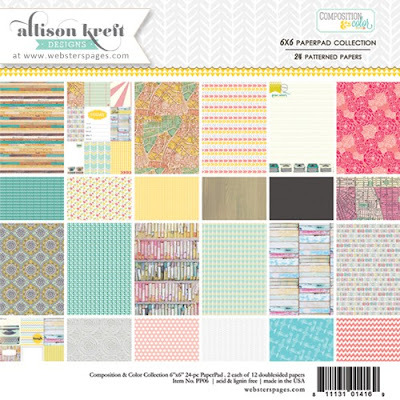 I am so wanting the Alison Kreft line right now! Weekend plans... It's snowing like crazy right now so I plan to stay indoors and enjoy having nowhere to go. May start painting my son's room. I want to start painting my craft room but I promised his would be first. Thanks for the inspiration! Love your sneak and that second layout of Leah is amazing! Love the sneaks! Nothing much going on this weekend... Relishing a few days off, running errands... The usual. Thanks for the chance! My plans are to stay in and get some rest (I'm sick right now, booo) and get some scrapbooking and homework done! JUST LOVE LOVE your peak and yeah add me to the in awe of Leah! As far as this weekend. Today I'm blog hopping in my PJ's & tomorrow we head to Palm Sunday services.. Nice and sweet weekend just like I like it! Since we are expecting a spring snow storm, I'm staying inside and cleaning house and maybe can fit in a little scrapbooking too. I went out to dinner and shopping with my teenage daughter last night. Today I baked banana bread and movie tonight with hubby. Tomorrow is passover dinner with my best friends family. It's a beautiful ceremony that I feel honored to be a part of. Thank you for the inspiration. I LOVE your style. Take care, and I hope you are having a great weekend. Love the sneak Paige, Green is my favorite color. This weekend is all about chores and family time! I scrapbooked a mini album with my 9 year old niece. She is just precious and I love spending time with her. My 2Peas name is AnissaScraps. Oh what a sweet giveaway! My plans are to continue with the Project Life album! Very cute stuff you've got here! Plans for the weekend...a nice Sunday dinner with family. It's rare that we're not running around and have time to have a nice leisurely dinner. Lots and lots of homework this weekend, but I'm in the home stretch! Love your picks...all the girly things are fun! I will be painting my boys room this weekend...fun, fun, fun! 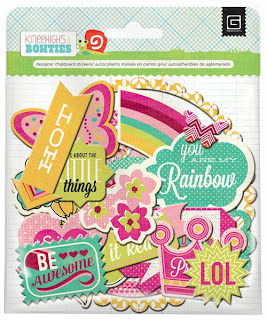 Your sneak look good, I love your scrapbook style and all the colorful shapes you come up with on your layouts!! My plan for weekend is making an mini album. Thanks for the chance to win! Your work is gorgeous and I can't wait to see that green layout. It looks beautiful. We will be getting Easter outfits on Saturday and then Church on Sunday. My youngest daughter is getting baptized, so we are very excited about that! Loving all the green and yellow in your sneak and those chevrons are in my bucket right now.